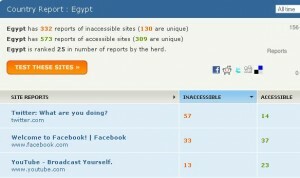 Is Egypt Blocking Social Media? Or Is It Not That Simple? Friday UPDATE: Shortly before midnight local time on Thursday, Egyptian officials ordered nearly all Internet and mobile phone service shut off across the nation. Officials at several ISPs and mobile service providers, such as Vodafone, issued statements explaining their actions by order of Egyptian authorities. Rather than trying to block or slow traffic to specific sites – for example to Twitter or Facebook – it appears authorities have opted for a near-wholesale blocking of digital traffic. Christopher Williams in The Telegraph explores how such a move affects digital communications in and out of Egypt. It’s a question that many have been asking lately: would the unrest on display in the streets of Tunisia spread to neighboring states? This week, we may have begun to learn the answer. 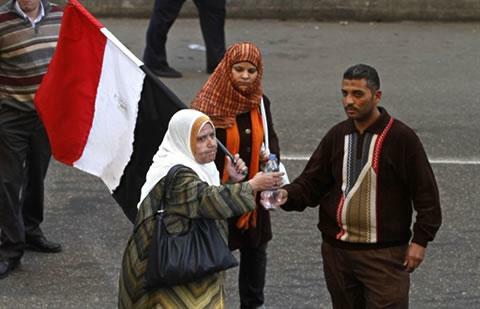 Over the last several days, Egypt has seen some of its worst civil disturbance in years. Protesters in Cairo have clashed repeatedly with security forces, while in Suez a government building was set on fire. The disturbances appear to have ebbed somewhat Thursday, but that may only be a temporary pause. Activists are calling for protests Friday after noon prayers, and Mohamed ElBaradei, former head of the IAEA and current Egyptian reform campaigner, said he intends to return from Vienna to join in. Many groups, like the 6th of April Movement, are using Facebook and other social media to organize the protests. VOA’s Bill Ide notes that while there’s a vigorous debate about just how large a role social media is playing in events, no-one is denying its possibilities. But are Egyptian authorities so worried about the Internet that they’re blocking parts of it? Yes, and no. The Washington Post’s “The Circuit” blog first reported Twitter blocking late Tuesday, and Twitter officials confirmed the reports Wednesday in a tweet. Facebook meanwhile said as recently as Thursday it does not believe it is being blocked in Egypt. 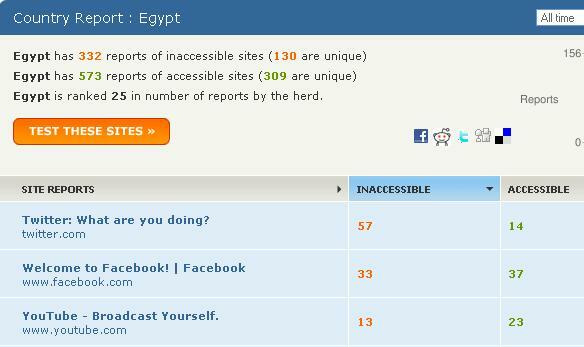 So what’s really being blocked in Egypt and elsewhere? Both Twitter and Facebook officials have suggested HerdictWeb as the most up-to-date source on whether sites are being blocked. A project of Harvard’s Berkman Center for Internet and Society, Herdictweb – “the verdict of the herd” – aggregates individual reports of blocked websites from around the world into one real-time report. “By crowd-sourcing data from around the world, we can document accessibility for any web site, anywhere,” they claim. As of 14 hours UTC Thursday, HerdictWeb had logged 57 reports of Twitter being inaccessible from Egypt, and 14 reports that it was. Compare that to 33 reports of Facebook being blocked, with 37 reports to the contrary. There are signs other websites are being affected. Almasry-Alyoum is a popular privately-owned newspaper in Egypt; however as of Thursday VOA access to both its Arabic and English language websites was spotty at best. It will take time to fully document what Egyptian authorities are or are not doing with the Internet. However, the story may not end there. There are new reports the events in Tunisia and Egypt may be inspiring recent protests in Yemen and in Jordan as well.